Casa Cabana is anything your kid wants it to be: a tree house, a haunted mansion, a pirate’s hideout, a lunar outpost. Created by Dutch design company Kidsonroof, this 100% recycled cardboard play house offers a ton of real estate for your rug rat’s expansive imagination, as well as a blank canvas for crayon-wielding redecorators. In addition to a pre-punched double door, seven windows, and an assortment of spy holes, Casa Cabana comes in your choice of blue or white, with or without the animal and tree silhouettes. Personally, we prefer the company of critter pals. Nos casa, su casa. Casa Cabana is anything your kid wants it to be: a tree house, a haunted mansion, a pirate's hideout, a lunar outpost. 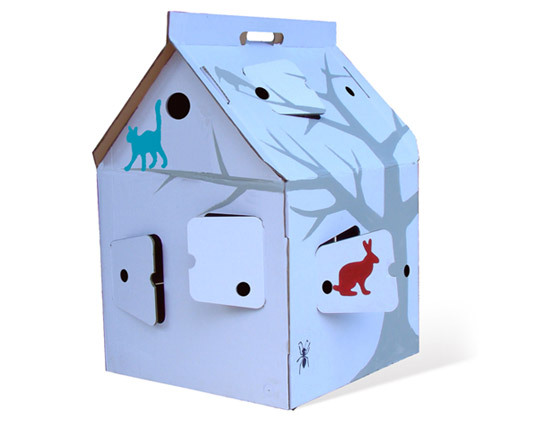 Created by Dutch design company Kidsonroof, this 100% recycled cardboard play house offers a ton of real estate for your rug rat's expansive imagination, as well as a blank canvas for crayon-wielding redecorators. In addition to a pre-punched double door, seven windows, and an assortment of spy holes, Casa Cabana comes in your choice of blue or white, with or without the animal and tree silhouettes. Personally, we prefer the company of critter pals. Nos casa, su casa.